We are still deeply in love with our care partner, but we are trapped inside our own body, often unable to explain to you what we want, how we feel, what we would like to do, and we feel devastated that you, our care partner, have to stand there watching us lose things like our smile, our muscle function, our speech, and our ability to swallow. We see how you react, watching the changes, we see it slowly ripping your heart out. It rips our heart out too. 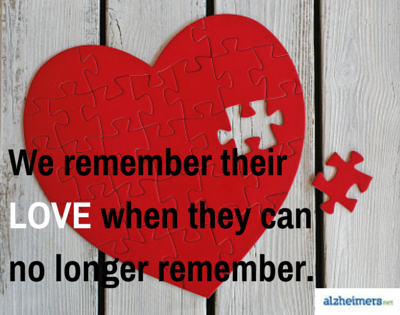 We do know how much our care partners have to do for us, and many of us feel guilty that it has to be so. We are dying from a progressive terminal illness, and have to live with that in the best way we can as well, which is not always pretty; it is tough on you, and it is tough on us. Even when we can no longer tell you, we love you. September 7, 2015 in Daily Blog. Beautiful blog, Kate! There needs to be something partners can reach for as often as necessary, especially when they’ve had a bad day, and partners appear distant, and the right words elude them. Perhaps a personal photo or keepsake with “I Love You” or similar words inscribed might serve as reassurance for all parties. All one has to do then is to pick up the object, and feel the warmth that they know is still there between them. My dad gave the best smiles, right up until the end…they told me he loved me. Thank you. Thank you for that reminder. I always wanted my mother to feel loved but I didn’t think of how she felt about me. Beautiful words from Kate, and so very true. Awesome:no other word for this post.